When she was born, the doctors had pronounced 5% chances of her survival. But she struggled to survive. And along with her, her family, her mother who can’t hold back her tears even today as she recalls the shock. In a miracle that followed, Avila Kane who was born with Down syndrome has survived for 17 years now. Requiring blood transfusion soon after birth, a call for action on the radio drew 100 donors to save her life. Through a meticulous follow up with the doctor, the mother ensured that her daughter endured the tribulations placed before her at such an early age. By the age of two, Avila’s speech was extremely limited, but that too was overcome later. The doctors encouraged her mother throughout. Avila got her admission in a regular school, in the ‘Resource room’ which just had a few students at that time. Now a full-fledged school called Fairyland, it provided Avila age-appropriate activities and opportunities to find her strengths. She participated in all the competitions conducted at the school from Kindergarten to High School. Avila’s parents assisted in whatever way they could to ensure her integration in the mainstream school was a success. Over the years, Fairyland School has been instrumental to give Avila exposure to a wide variety of activities such as Sports, Yoga, Music, Dance, Cookery, Floriculture, Home Vegetable Gardening, Embroidery, Tie & Dye Technique for fabric and Photography. Seeing improvement in Avila encouraged other parents to get their children to the school. Sports and dance emerged as her strong inclinations. In class 4, Avila was able to teach yoga, as part of the sports curriculum, to students of Class 6. Her penchant to dance often saw her replicating steps from the TV. The other sports of her interest are Football, basketball, badminton, and Athletics. Avila joined Special Olympics in 2012 in roller skating with Gareth Vaz as her Coach. She is currently preparing for Roller Skating at the Abu Dhabi games. 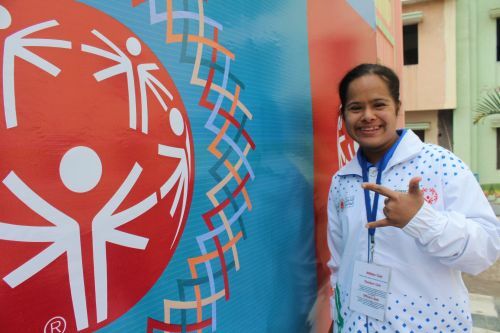 At the time of joining Special Olympics, Avila was resistant to her Coach and his guidance. It took nearly eight Months for Gareth to strike a meaningful connect with her. In fact, Gareth registered in the Special Olympics PG Diploma Course, Coimbatore to understand Persons with Intellectual disabilities disturbed by this communication gap with Avila. On completion of the same, he felt confident and equipped to train Special Athletes. With Avila, he has reached a juncture where she assists him in training other Athletes. Gareth, who is Director, Sports with the Don Bosco School Goa and also a SO Bharat Coach since 2012, is currently coaching 15 Special Students along with others. He is also considering to train Avila to teach more Coaches so that they can go back to their respective Special schools to train the Athletes. Considering the sportsmanship in her mother who was good in Athletics and Throw ball in school, predisposes Avila to take sports seriously. She is carefully guided through a regular exercise and sport routine at home which has also helped her to be physically fit. She looks after herself well, waking up at 5:30 AM every day. Avila speaks and understands Marathi and English. She is very cheerful, friendly and social. She likes to reach out and help others. She is lucky to be loved by everyone in her family. Being the only girl in the joint family, she holds a special place in the hearts of her family members. Extremely happy today, she distributed sweets on completing Class 10 with a good result. “I have no words to express what Special Olympics means to us and Avila. She would not have been social, confident and smart. She would not have reached thus far without support of Special Olympics. Gareth is a great mentor. I will continue to train her in sports and yoga so that she can pursue training many more persons to benefit through this transformative sports experience”, says her mother.